Chances are the person finding an injured wild animal has never even heard of Capture Myopathy much less has it foremost on their mind. Capture myopathy is a disease complex associated with the capture or handling of any wild animal. The body’s reaction to abnormal states such as infection, injury, extreme temperature, or even fear is stress. Capture and restraining an injured or ill animal is extremely stressful. Stress can result in capture myopathy. Therefore anyone handling wild animals in any professional capacity has capture myopathy on their mind most of the time. It’s a misnomer for it to be called capture myopathy in some ways, because the animal doesn’t have to be captured. It doesn’t even have to be chased if it’s a susceptible animal! It doesn’t take long for capture myopathy to be a factor, either. At Wild Instincts, any attempted capture of an animal needs to be done in less than 2 minutes. This means lots of planning ahead to make sure we aren’t adding to the stress of animal we’re trying to help; we’re not inadvertently causing the future death of an animal we’re trying to save. Wildlife rehabbers are well aware that an animal that is injured, ill or orphaned is already experiencing great stress. It may be in pain, dehydrated, starved and fearful. Rehabbers go to great lengths to minimize further stress as much as possible. Some species are more susceptible or prone to capture myopathy such as deer, rabbits, and even birds like sandhill cranes. It’s even been reported in fish. In wild animals especially, an immediate reaction to stress is the “flight or fight” syndrome. The body responds accordingly by producing adrenaline. Persistent stress keeps this reaction at a dangerous level. Severe stress over days or weeks can cause chronic metabolic upset, increased susceptibility to stress and eventual death. Capture myopathy is also known as white muscle disease. When the muscle is used its metabolism changes from using oxygen to using stored energy in the muscle. This leads to a build up of lactic acid which goes into the bloodstream where it changes the pH of the body and affects the heart output. If the heart doesn’t pump correct oxygen to the muscle, the muscle starts to die. Over the next week or so, the product produced by the muscle’s death damages the kidney and affects other organs. There are four categories of capture myopathy ranging from peracute with death resulting in a matter of minutes to chronic where the animal may survive days or even months, but will often die from heart failure. Chronic capture myopathy breaks the heart of many, many rehabbers. We sometimes let ourselves be fooled into thinking we have pulled an animal through some pretty rough times and the worst is over. We think maybe this individual isn’t too susceptible to capture myopathy. We sometimes forget to be guarded and start thinking about releases. Then the animal suddenly dies, almost unexpectedly. There is no treatment for capture myopathy. Prevention is the only treatment. That’s why you’ll get the same advice from rehabbers across the country. Keep the animal dark and quiet until you can get it to help. This reduces stress and the therefore the chance of capture myopathy. Sometimes we don’t get to plan ahead for an animal’s rescue and it’s already probably too late for us to do anything about it. 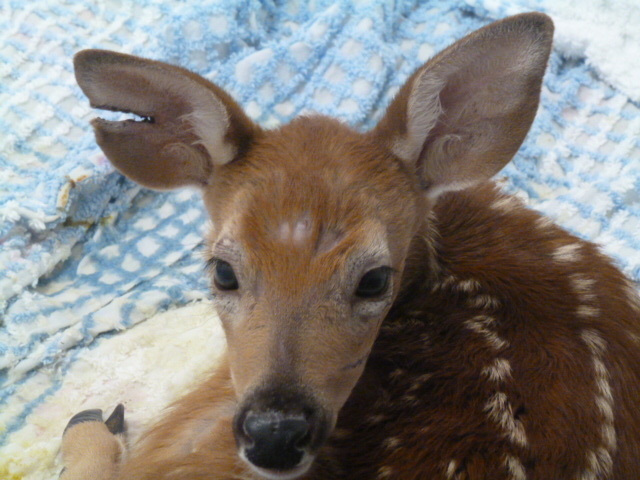 On August 2, 2012 we received a fawn that had been attacked by a bear. People looked out to see a bear carrying a fawn across their yard. Their dog saw it too and gave chase. The bear dropped the fawn. Then the people couldn’t find anyone to bring the fawn to for help. They did the best they could and fed her what they thought they should for a few days, not knowing it was not good for her. She then was transferred to a center not permitted to treat it and eventually found her way to us several days after the initial bear attack. We treated her and she rallied. We held our breath. Our supporters rallied, sent good thoughts and even Reiki. She improved. We let our guard down a little. She had some ups and some downs but we started to think maybe she’d make it to release. She passed away on August 24th, three weeks after she was admitted. 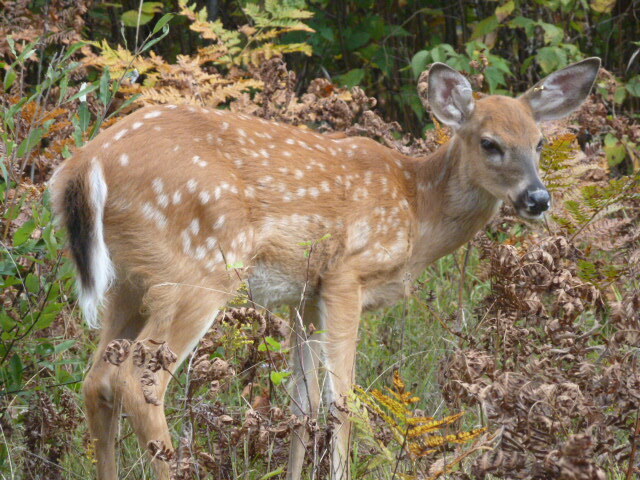 Nine fawns were released back into the wild over the course of yesterday and today. We celebrated and rejoiced for the ones that made it but we remembered bear attack fawn and the others that capture myopathy took from us. May you ALL run free and wild.